Before we start for real, what’s a set? Say we have the numbers 1 through 4. In a list, that’s easy enough: [1, 2, 3, 4]. And, in a set, it’s still [1, 2, 3, 4]. The difference comes with duplicate elements: four ones in a list is [1, 1, 1, 1], but in a set that’s just . You can use sets for tons of neat things! Relational databases use sets as the basis for operation, and TLA+ uses set logic to do formal verification of software. If you’d like to find out more about set theory later, Wikipedia has got your back. What are our sets made of? 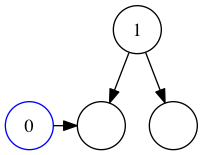 A binary search tree containing 1, 2, and 3. Empty circles represent empty trees. 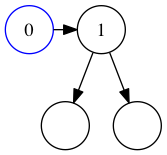 An element in this particular data structure has a head (the top node) and two sub-elements, or sub-trees. 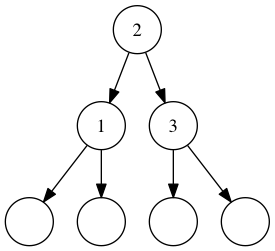 The left tree contains items less than the head, and the right tree contains items greater than the head. If there are no items less than or greater than the head, the trees below it are empty. In the example above 2 is the head, with 1 on the left and 3 on the right. We don’t have any values other than those three, so the other subtrees are all empty. This all sounds kiiiiind of complicated. Why are we using this particular data structure? Well, think about this: if a node can contain one value, and things greater and less than that value, then we have disallowed duplicate items. We didn’t have to write complicated code to do this, we just had to choose a structure that made impossible states (duplicate values) unrepresentable! Enough theory! How does this look in actual code? Our Set type takes a comparable as part of the type. comparable refers to any type whose values we can compare, for example 1 < 2 or 'c' > 'a'. In Elm, this means we can use Int, Float, Time, Char, String, and tuples or lists of those types. First, we need to determine if the set is empty. If we’ve got an empty list, we don’t need to worry about inserting on the left or the right; we can just create a new singleton! If the item we’re inserting is less than the head, we insert into the left set. If it’s greater, we insert into the right set. If the two values are equal, we do nothing. The item is already present, so don’t make any changes! Then, after we’ve figured out where we insert, we’ll do it again for the next level until we get to either a level that doesn’t have a value (empty) or a value we’ve already seen. A singleton set containing 1, and a new value 0. Comparing the inserted value to the head. We find that 0 is less than 1, so insert the new item to the left. This is the same as calling insert 0 Empty, since the left node is empty. 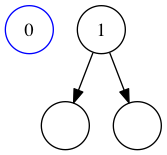 Comparing the inserted value to the left branch. This time around, the set in question is Empty, so we’ll return a new singleton. Our new set then bubbles up through the recursive calls. It ends up replacing the left branch of the original set. The original call returns with the modified set, and we’re finished. 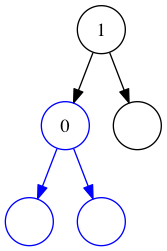 The final tree, with the new value inserted. Now, that takes care of inserting a single value, but what if you have a list? All it takes is List.foldl! To put this in English: starting from the beginning, insert the items one at a time into a new set. This is the functional equivalent of a for loop with an accumulator. We’ve got a good foundation, but we have quite a way to go. Next time we’ll going to look at how to tell if a set contains a value. We’ll also cover how to measure how many values are in our set.